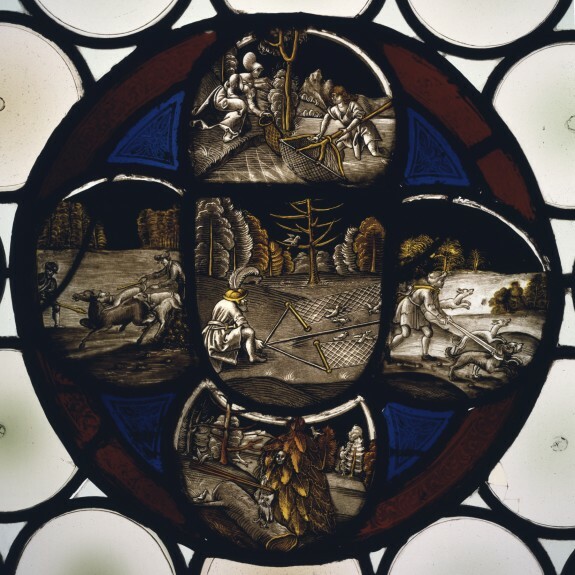 Description This roundel with scenes of hunting and fishing was probably part of a series commissioned to be set into windows in a small domestic room. The composition is based on a drawing by Hans von Kulmbach, the most important painter in Nuremberg after Albrecht Dürer and the leading designer of stained glass in the city. 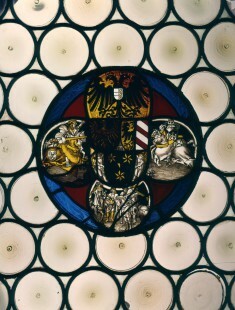 The painter was a member of the workshop of Veit Hirsvogel, the leading stained-glass painter in Nuremberg. 3000 Years of Glass: Treasures from The Walters Art Gallery. The Walters Art Gallery, Baltimore. 1982. Painting on Light: Drawings and Stained Glass in the Age of Durer and Holbien. J. Paul Getty Museum, Los Angeles; Saint Louis Art Museum, St. Louis. 2000-2001. Provenance Gender von Heroltsberg family, by commission; H. G. Gutekunst, Stuttgart, 1877 [mode of acquisition unknown]; Felix, Leipzig, 1911 [mode of acquisition unknown]; Stillwell, New York [date and mode of acquisition unknown]; Arnold Seligmann, Rey and Co. [date and mode of acquisition unknown]; Walters Art Museum, 1951, by purchase.